One of the iconic maps of the golden age of Pictorial Maps. A Map and History of Peiping; formerly known as Peking; capital of provinces, princedoms, and kingdoms since 1121 B.C. ; in 1264 A.D. the capital of the Mongol Empire of Kublai Khan; made the capital of the Ming Empire and built as it is today by Yung Lo in 1421; continued as the capital of the Chinese Empire through the Ming and Ching Dynasties; and now a city which will live long in the memory of man as one of the greatest the world has ever known. Completed on this fifth day of February in the year of our Lord Nineteen Hundred and Thirty-six. A beautiful example of Frank Dorn's iconic 1936 pictorial map of Beijing or Peking, China. Considered one of the great maps from the Golden Age of Pictorial Cartography, this map details Beijing as contained within the old city walls as well as parts of the surrounding area. Dorn combines cartographic accuracy with a dense array of ethnographic and historical vignettes intended to illustrate this history of Beijing. Some of these include the Old Execution Ground, the Eunuchs' Cemetery, the Dog Temple, the Temple of Eighteen Hells and the Spider Pagoda, among countless others. The elaborate border takes the form of a chronology of Beijing, with illustrated annotations such as 'Decadent Period under the Ch'ings' and 'Capital of Kublai Khan 1264'. This is the first edition of this map, as it bears the flag of Nazi Germany in the Legation Quarter. Later editions of the map removed the Nazi flag. This map is Dorn's only cartographic production and grew out of his fascination with Chinese history. 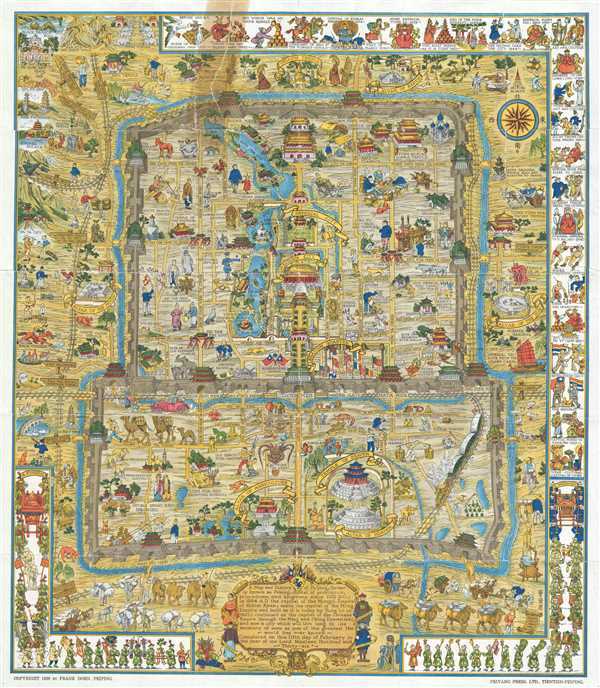 The preface to his 1970 book The Forbidden City: The Biography of a Palace, Dorn describes the inception of this remarkable map:. I developed an interest in the Forbidden City and other imperial residences, first from casual sightseeing and then from conducting important visitors and tourists through the palaces. A growing familiarity with the buildings and courts soon became an absorbing urge to learn more about the history and legends connected with those who had created and lived within the walls of the palace-city. The first result of my researches was a pictorial map of Peking, after which I was completely hooked on the whole fascinating subject. Dorn's inspiration in creating this map may well have been the work of California artist Jo Mora (1876-1847), with whom he was a friend and admirer. The whimsical style, bright colors, and overall design is certainly highly reminiscent of Mora's work. This map was published in Tientsin and Beijing, China by the Peiyang Press, in 1936. Frank 'Pinky' Dorn (June 25, 1901 - July 26, 1981) was an American artist, 'old China hand,' and military officer active in East Asia during the middle part of the 20th century. Dorn was born in San Francisco California and later studied at West Point after which he was commissioned in the Field Artillery. He served in the Philippines from 1926 to 1929 and became an instructor at the Field Artillery School from 1930 to 1933. Moved to Beijing in 1934 where he studied Chinese. It was during this period that Dorn made his greatest contribution to cartography, his iconic pictorial Map and History of Peiping. Dorn's important map, issued in 1936, followed in the artistic-cartographic style of Jo Mora (1876-1847), with whom he was acquainted and whose work he admired. During the war he was assigned as an aide to Brigadier General 'Uncle Joe' Stilwell in the Burma theater under whom he served from 1939 - 1942. There is some indication that Dorn may have served as a field cartographer under Stilwell, but none of these maps seem to have survived. After the war he was elevated to the rank of Brigadier General and served from 1944 to 1945 as the commander of the China Training and Combat Command. He retired 1953 and returned to San Francisco where he devoted the remainder of his life to painting. Apparently he got in with the psychedelic movement and produced a number of paintings to this effect. Dorn died in 1981 and was buried with full military honors at Arlington National Cemetery.